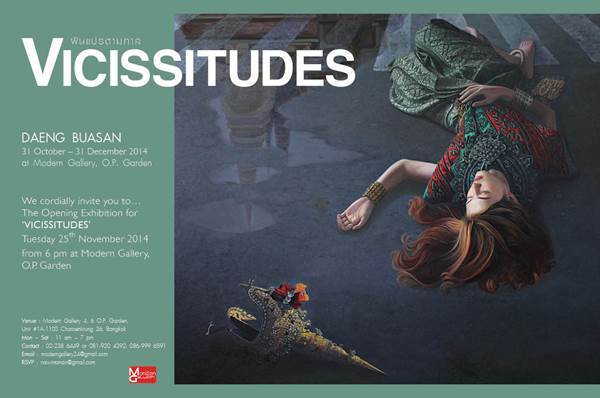 On Tuesday 25th November, Daeng Buasan will be winding back the clock on Thai Culture and Society, and he wants you to tell him what you see and feel with your own heart in his new, touching exhibition, Vicissitudes. Buddhism tells us that nothing is permanent and that change is the only ever constant. Now, over the years, whether those changes in Thai Culture and Society have been for better or worse, Daeng Buasan’s exhibition does wish to say. But rather, he wants to invite you in and give you the chance to pause, reflect and open your heart. So, come and tell Daeng Buasan what your hearts says. Fascinated by Buddhist Art at an early age, and inspired by its philosophies, Daeng Buasan, is a suburban kid at heart, who started out as a mixed media artist, but now focuses solely on oil and acrylic painting.